We all know that we shouldn’t drive while we’re talking on our cell phones or eating, because studies have shown us that distracted driving is just as dangerous as drunk driving, based on how it impairs reaction times in drivers. We even recently highlighted a study from the Centers for Disease Control and Prevention (CDC) that showed many improvements in teen driver safety, specifically in the realm of distracted driving. But a previous survey from State Farm Insurance showed that a majority of young drivers still engage in text messaging while they are driving. Many improvements have been made in the realm of public safety when it comes to distracted driving, especially among unseasoned teenage drivers. Today, text messaging while driving is illegal in 39 states and the District of Columbia and statistics have shown that public outreach campaigns have been effective in spreading awareness about the risk of injury and even death as a result of distracted driving. But the evolution of technology has obviously changed the culture of driving throughout the United States. Now, cell phones can serve as navigation systems and hands-free communication devices, which can make a driver safer in some instances. But the other side of the coin is that cell phones and other electronic devices serve as a conduit for distracted driving as well. In fact, many state laws permit cell phone use by drivers if they are using the navigation or other non-communication features on the device. Needless to say, this makes the enforcement of these laws a bit trickier for law enforcement since the primary source of detecting distracted driving is by physically witnessing the driver using his or her cell phone. Every year, State Farm Insurance conducts an annual survey that analyzes driving trends among its customers. With the increased awareness and interest about the dangers of cell phone use behind the wheel over the years, that survey has begun to include data about dangerous habits related to distracted driving and car accidents as a result. Last year, the company found that 64 percent of drivers between the ages of 18 and 29 who were surveyed had engaged in sending and receiving text messages while driving. 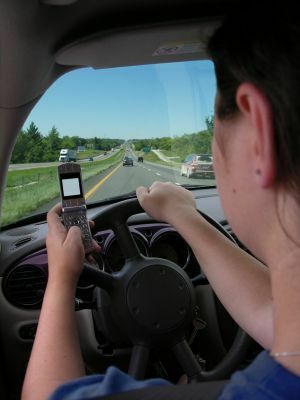 Furthermore, 32 percent of all drivers surveyed had engaged in text messaging behind the wheel. But don’t hold your breath. Because when State Farm conducted the same survey in July 2012, they found some pretty disturbing results; the rates for both the 18-29 demographic and the total drivers surveyed increased significantly, suggesting we are not making as much progress in deterring distracted driving as we may have thought. According to the results published by the company, 68 percent of drivers in the 18-29 age group reported engaging in text messaging to some extent – a four percent increase from a year ago. There was also a two percent increase in all drivers as a whole using text messaging, as the rate jumped to 34 percent. This is extremely troubling news for public safety advocates and lawmakers alike, because after multiple years of public outreach it sheds light on the level of effectiveness of these campaigns. Perhaps over the last year or so there has been a disconnect or lack of resonance among younger drivers, but the data indicates that all drivers in general have likely engaged in text messaging this year more often than last year. It’s safe to say that the results of this particular study from State Farm shows the potential for more dangerous roadways, as unsafe driving practices generally mean there is a higher risk of distracted driving accidents on the roadways. It will be interesting to see what public awareness groups respond with in an attempt to reverse this trend.